Pink Bat Movie Everywhere you look today there are problems. Turn on your TV or computer - pick up a magazine or paper - and what do you see? Problems! Talk to your spouse, co-worker, family members or friends, and within minutes someone will bring up a problem...or two or three. Problems permeate the workplace, too - new products, old products, customer service, health care, retirement plans, sales, marketing, budgets, IT, personnel - the list of problems we confront each day is vast. If that's not enough, consider the global problems we are facing - hunger, war, terrorism, economy, jobs, pollution, global climate change, disease, energy, health care, education, government corruption, trade barriers, overpopulation, sanitation, water - the world's problems seem endless. In short, we are experiencing a "problem pandemic" like never before. What's scarier yet, is many experts predict there is no end in sight. So what can YOU do about this threatening pandemic? Embrace it! This may seem strange at first, but by the time you finish reading this book, you will realize many "problems" aren't problems at all. In fact, most problems are opportunities and many are actually Pink Bat Movie - unseen solutions just waiting to be found. Can you imagine waking up each morning faced with a "solution pandemic?" Start imagining. Maybe you think this idea seems impossible, but you're about to discover: " Pink Bat Movie Thinking" makes the impossible possible. 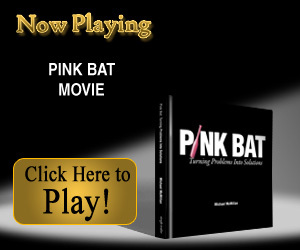 What you just read was the introduction to Michael McMillan's unforgettable Pink Bat Movie. Rarely do I use the word genius...but I make an exception when it comes to Michael McMillan. Michael's mind works in amazing ways and his ability to tell a story in a way that you'll never forget is...second to none. If there's one powerful lesson you can take away from this story, it's that it is entirely possible to turn an unfortunate situation into an amazing opportunity. It is up to you to make your own luck. Don't let problems dictate your future, you can turn those problems into solutions with the help of Pink Bat Movie thinking. There's a bit of magic in everything, and some loss to even things out. ~Lou Reed, "Magic and Loss"
Every path hath a puddle. ~George Herbert, "Jacula Prudentum"
If you're in a bad situation, don't worry it'll change. If you're in a good situation, don't worry it'll change. ~John A. Simone, Sr. If you know someone who tries to drown their sorrows, you might tell them sorrows know how to swim. ~Quoted in P.S. I Love You, compiled by H. Jackson Brown, Jr.
We look before and after, And pine for what is not; Our sincerest laughter With some pain is fraught; Our sweetest songs are those that tell of saddest thought. ~Percy Bysshe Shelley, "Ode to a Sky Lark"